Richard Milton gives a fresh perspective on the tumultuous, painful love-hate relationship between Britain and Germany, in which he sees the beginnings of modern PR and propaganda. IMO, this book can be evaluated as either magnificent or plain good. 1) Magnificent because it's the first I have read  to say in so many words that " ... though the British style may be very different from many other nations, Britain's history is no different from any other - proof, if proof were needed, ... that, given its fifteen minutes of fame on the world stage, Britain was both as good, and as bad, as everyone else that fate has granted a roll at the dice of history" (page 321). Since it's implicit in this paragraph that the same can be said of the US and its moralizing stance, it takes a certain courage to write it, since the idea is likely to cut sales in the book's main markets. a) I don't know if Milton is the first to have surmised that Bernays, an American nephew of Freud, was Goebbel's inspirer, but he gives disproportionate space to proving that theory (some three chapters, dispersed throughout the book). This is, to my mind, wholly unneccessary. The biography of Bernays has nothing to do with the main thrust of the argument, and if Milton wanted to nail the coffin of his thesis (that everything the Germans did their enemies did first), a brief mention would have sufficed. b) In an effort to be complete, Milton throws in a chapter (n° 18) on Allied-German collusion in the economic sphere, even as the war was in full swing. It has no clear purpose, adds nothing to his thesis (since both sides come out equally badly) and contains no new material. c) That the book was hastily written is shown by the number of times Milton posts the same material in different places. One example is Churchill's assessment of Hitler, which is repeated almost verbatim in pp. 150 and 272.
d) There are a number of dubious assertions. About Nietzsche: "his writing is still the best-known source of fascist philosophy ... Nietzsche is, rightly or wrongly, often regarded as the chief fount of fascist ideas" (p. 119), and "Nietzsche is widely seen now as the chief herald of Nazism" (p. 120). Well, it's not as straightforward as that. Then, in p. 105, Milton quotes Gobineau as saying "We do not descend from the apes, but are headed in that direction" in 1855, four years before "The Origin of the Species". It's true that Lamarck published earlier, but he didn't assert that men descended from apes. Or listen to this "[Hitler's] victory in France had been due not only to military skill but also to a large dose of luck" (p. 219). Plain wrong, Mr. Milton. Or, in p. 114: ""dramatic and continual" increase in population during the XIX C "due mainly to industrialization". You don't mean absence of major wars after 1815, and improved sanitation and food availability, but just more textile mills and Bessemer furnaces? Or, in p. 19: "Germans became the most enthusiastic exponents of Charles Darwin's evolutionary theories: the survival of the fittest and mankind's descent from ape-like ancestors". C'mon, this is written for first-graders! Let's go on: "The British Empire ... was in reality a jumble of rickety, near-bankrupt, under-founded outposts" (p. 140); "The empire contributed little to imperial defense and on balance was a drain on British resources" (p. 143). Milton here depends heavily on Clive Ponting's book '1940: Myth and reality', which I have and judge to be very interesting, but however mistaken on this point. Nobody would dispute that the sprawling Empire was difficult to defend; but a NET drain of resources ... why, if one of the main reasons the US had for helping the UK in WW2 was to dismantle the system of Imperial Preferences and closed markets and turn it to its advantage! And last but not least: "If we could get out of this jam by giving away Malta and Gibraltar and some african colonies, he would jump at it" (Churchill's words in the 05/26/40 War Cabinet' meeting, as reported by Halifax) (p. 240). I don't believe Churchill, the arch-imperialist, could have even contemplated giving away two of the four keys to India. But these are flies in the ointment. I would unconditionally recommend buying this book for a new, even if perhaps slightly flawed, perspective. Since however, lacking page numbers in the references, it's as good as unsourced, and summarizes Ponting's book too much, buy that first, digest it, agree or disagree with it, and only then read this one. To my knowledge, the first to say "Woe to the vanquished! ", and thus to imply that history is written by the victors, was actually Brennus, the Gallic chieftain who defeated and ransomed Rome in 387 BC. This book, first published in 2007, comes hard on the heels on John Ramsden's Don't Mention the War (2006) which I have reviewed on Amazon; and, like its predecessor, it leaves one with the same skewed impression: that in Anglo-German relations the English have committed as many sins as the Germans. The opening chapters in Ramsden gave an interesting survey of how the English had looked on the Germans on the 19th century (and indeed earlier). Milton's chapter is much more cursory. 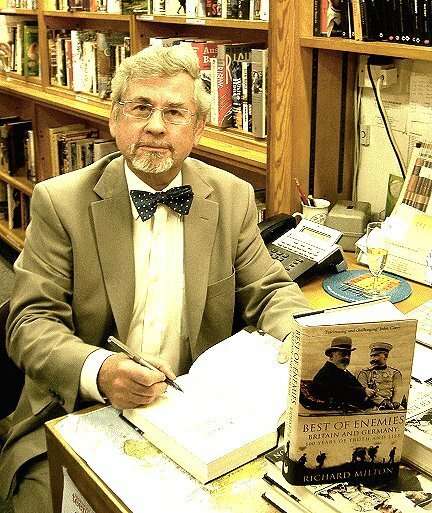 He notes how Englishmen and Germans used each others' inventions and copied each other's sartorial and intellectual fashions, to such an extent (he says) that around 1898 Britain was closer to Germany than to any other country in the world. Milton then plunges straight into the propaganda war once the war had broken out. It is the effect of propaganda in particular that is of special interest to him. Like Ramsden, Milton now devotes acres of space to blameworthy material from Britain, while dealing very briefly with similar material from Germany. So, for example, the bulk of the chapter on propaganda during the First World War deals extensively with untrue stories spread by the British about German atrocities while devoting just 13 lines to comparable atrocity stories spread by the Germans. Later chapters deal with propaganda in the Second World War. There is a long chapter on the Eugenic Movement in Britain, full of chilling statements by famous Britons, writers, medical men and politicians (in 1906 even Sir William Beveridge wanted people living on benefits to lose the franchise, civil freedoms and the right to fatherhood), supporting the compulsory sterilization of the feckless poor, and sometimes advocating their elimination. The reminder how many people embraced such vile ideas is of course deeply shocking, and would make a good book on its own; but in the context of the present book's overall message - that the roots of Nazi eugenic and genocidal excesses lay in Britain - it is, I think, distinctly tendentious. Only towards the end of the chapter is there the statement that Britain was the only Protestant country which did not in fact introduce eugenicist legislation: the opposition to it was simply too strong. Milton could presumably have matched the lavish quotations in support of eugenics with an equal number of quotations from its opponents in Britain, which would explain why the campaign did not succeed: not one is mentioned. Milton even says that `it is not difficult to argue that Britain's ruling class in the last decades of the 19th and the first decades of the 20th qualified as a fascist or quasi-fascist government' (p.148). The German fascists appear to have seen Britain as such originally: from Hitler downwards, the Nazis admired England and saw it as a model. In Mein Kampf Hitler had condemned Germany's fleet- and empire-building programme which had made Britain and Germany enemies in 1914. Germany, he wrote, should have taken up Britain's proposals for an alliance at the turn of the century, which would have left Germany free to expand into Eastern Europe; and this, an alliance between two ruthlessly expansionist imperial powers was, he thought, still desirable after the First World War. And of course it is true that elements of the British upper classes and influential press barons admired Hitler and wanted an alliance with him against communism. Until September 1940 Hitler still thought such an alliance was possible; and Milton once again gives more emphasis to British politicians who sought peace at that time than to their failure. On p.269 Milton again talks of `the fundamentally fascist nature' of both British and German society between the wars, the main difference being that the leaders of British society were aristocrats who despised the humbler class origins of most of the German leaders. He gives as a striking example Churchill's contempt for the former house-painter (though Milton then recognizes that Churchill was `in many respects a liberal democrat by nature' and even as one `who believed profoundly in democracy'.) Milton suggests repeatedly that Britain, with her record of conquest and ruthless suppression of colonial territories (and for some years after the end of the Second World War) was hardly in a position to lecture the Germans. And though he repeatedly says that the Nazi war-criminals richly deserved to hanged, he expresses the doubts that many people have about the Nuremberg trials being an example of `victors' justice'. There are occasional reference in the book to the Nazis pushing what they inherited from Britain to the most horrific excesses. 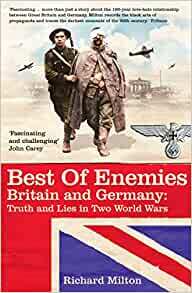 But though it is full of uncomfortable truths about Britain, in the context of comparisons with Nazi Germany in particular, seem to me to give a seriously unbalanced tone to the book.